This week I showed King Corn at the USO on Camp Humphreys. 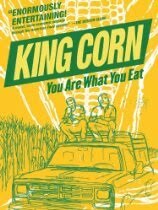 King Corn is about 2 college graduates that set out to discover why a hair analysis revealed significant quantities of corn. They move to Iowa and raise an acre of corn from start to finish, then try to find out what happens next - corn fed livestock and chickens, not to mention the production of high fructose corn syrup. You get the idea.